Vengeance is not OURS, despite how we may feel. We live in a world where the media tries to manipulate us every day. They encourage us to think one way or another and are quite happy to put their world slant on their reporting. It is refreshing when you read or hear from a reporter that reports what they saw, heard etc. without putting an individual or corporate slant on their version of the truth. However, this is getting to be quite rare. I have been amazed at the medias response to the Trayvon Martin vs George Zimmerman trial. They have made it into a racism case from the get go. NO one was there at the time of the confrontation except George Zimmerman and Trayvon Martin. I watched and listened to the trial and have my own opinion about it but the fact of the matter is, I have heard Christians calling out for revenge on George Zimmerman. This is wrong on so many levels. The fact is the case went to court, the jury decided and the verdict stands. Vengeance is not ours! I can understand non-believers being vengeful but NOT Christians. We have the Spirit of God in us. If we think the verdict in this case is wrong, we still have no right to call out for vengeance! 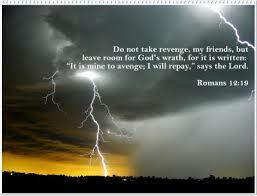 And as Paul tells us in the book of Romans 12:19 NIV 19 Do not take revenge, my dear friends, but leave room for God’s wrath, for it is written: “It is mine to avenge; I will repay,”says the Lord. Instead of complaining and griping about the verdict, why not make a decision to do what you can during your lifetime to reach out and help others outside your own personal circle. God does not see us as different races in Christ. He sees us all as His children and perhaps it’s time for each of us to do the same. Not just in our words, but in our actions! Galatians 3:28 NIV 28 There is neither Jew nor Gentile, neither slave nor free, nor is there male and female, for you are all one in Christ Jesus. Colossians 3:11 NIV11 Here there is no Gentile or Jew, circumcised or uncircumcised, barbarian, Scythian, slave or free, but Christ is all, and is in all. As followers of Christ, too often we spend more time complaining about the way things are instead of trying to make a difference in the way things can be. If you have followed the trial and believe the verdict was wrong, use this as a platform to try and make a difference. Reach out and show love and understanding to people outside your personal circle. If you happen to agree with the verdict, do the same! Complaining, tweeting and griping won’t do anything. Do something tangible to demonstrate the love of Christ to others! Make a real difference! Don’t be an armchair quarterback. Get involved and bless others. Ultimately, George Zimmerman is answerable to God for his response in this crime, not us! Luke 6:37 NIV 37 “Do not judge, and you will not be judged. Do not condemn, and you will not be condemned. Forgive, and you will be forgiven. ← Who do you turn to for advice? I think it was evident that race played a part in Trayvon’s death because Zimmerman had made many calls about young, back men in the neighborhood. There’s a lot of anger because of this country’s complicated racial history, not necessarily because of media manipulation. However, you are right that vengeance belongs to God and we will all be judged for our actions. I think this is definitely a time of reflection, especially for me, as a mother raising a young black son. I worry that he could grow up and be targeted just because of the color of his skin. There is no way for us to know George Zimmerman’s heart or Trayvon Martin’s heart. That’s the bottom line. The media played the story up for ratings and to excite the public. For us believers, our heart has to be tender to both sides and lashing out at one over the other is acting just like the world. Onyih, my daughter is black and I understand your concern for the possibility of your son being targeted however, I do believe we have to react out of love and not vengeance. That’s all. 🙂 Thanks for your comments. They are very much appreciated and blessings! The bottom line is that nobody knows what was in Zimmerman’s heart the night he shot that young man; we only have the law to go by. From what I have seen, he was not a racist. This is obviously a very sensitive issue, but the reason I don’t believe it was racism is because racist always have a history of saying and doing racist things – if he was a racist, the prosecution could have and would have found numerous witnesses to testify about the things he has said and done – racists always have a habit of making racist comments. Besides, he has several African-American friends, he took an African-American to prom and he tutored students of all races. I have known racists; these are things they would not do! The Bible tells us not to take vengeance, but it also tells us not to make false accusations. I agree with you. Personally, I don’t believe this was a racial issue either but there is no way to know for sure one way or the other. We can’t control what happened but we are responsible for how we respond as believers. There was a similar siatituon in Arizona a few years back A New Times reporter was investigating the finances of Sheriff Joe Arpaio (love him or hate him), and got the country’s toughest sheriff upset enough that Arpaio threatened the magazine. In response, New Times included Arpaio’s home address on the cover of one of their issues. However, when it was published on the e-zine version of New Times, that caused a big uproar.There’s an Arizona law that states that it’s a felony to put addresses and other personal data of police officers on the Internet — if that information posed an immediate and serious threat to the officers and if the person who published had meant for it to be a threat. (Surprisingly, it does not prohibit newspapers or television from revealing the same information. )New Times reported that the information they posted was freely available on the Internet, and that they were not doing any additional harm.The law was not actually tested in court, since Arpaio’s lawyers felt that there was not a immediate and serious threat — For one thing, their delayed reaction did not suggest that there was any threat. You have shared some very insightful things on this post. Vengenance DOES belong to The Lord and we as Christians should be a light in this dark world. So whether we agree or disagree with the verdict, it helps to display a better character in Christ by not engaging in conversations that will not help society. While I tend to stay away from controversial topics especially when it comes to race, I decided to comment. I did not watch the entire case about Trayvon Martin/ G. Zimmerman or Casey Anthony. (Wow. I did not know she was acquitted) This just shows you how much I watch television. Anyway, I can see how feelings are stirred regarding race in general in this society but I honestly don’t know if it was a factor. I’m a mother of 2 black sons. Do I worry about them being targeted as black men. Not really. God is my foundation and I can only trust Him to protect them in their lives. As parents, my husband try to raise then up in The Lord to do and speak right. Proverbs 22:6 is groundbreaking for me personally. In this society we tell and teach them about what’s going on and how they should treat others as well as to how they act. Will it always work in their favor? I don’t know. We have not crossed that bridge yet but what I do know is that I never want them getting caught up in garbage from tv or from others around them. Needless to say, my heart was broken and breaks for the Martin family and anyone in general regardless of race when I hear that a loved one was killed or kidnapped. I can’t begin to understand their pain. As for George Zimmerman, I pray also for his safety but more so his salvation because if he killed the teen with wrong motives, God is the righteous Judge and will deal with him on judgement day. A lot of things get by in this world without justice and it hurts. It’s still on God for the final judgement. I told my children that if people get away with things in this life or justice is served in this life, we are all Gods children and anyone has the opportunity to be forgiven receive salvation. So whether its in the streets of freedom or behind the jail walls Jesus is made available to all who wants eternal life. The thief who hung on the cross next to Christ was received. As long as we have breath in us, it’s never too late. Mercy and grace must find their way within us. All of us. Crime is bad and sin is sin. We’ve ALL committed some sin against The Lord whether sinner or born again Christian. The scripture that weighed on my heart after the Trayvon case was: ““You have heard that it was said, ‘You shall love your neighbor and hate your enemy.’ But I say to you, love your enemies, bless those who curse you, do good to those who hate you, and pray for those who spitefully use you and persecute you, that you may be sons of your Father in heaven; for He makes His sun rise on the evil and on the good, and sends rain on the just and on the unjust. (Matthew 5:43-45 NKJV) The part that stuck with me was that Gods sun rises and falls on the good and evil and that He sends rain on the just and unjust. That’s all I can do regarding this world….. Believe on God for whatever He allows and whomever he blesses no matter their status. God is still God and He has the final say at the end. No one gets away with nothing whether its done it the light or the dark. Terra what powerful and beautiful words! Thank you for your input! My heart hurts for the Martin family too. We lost our son Daniel at Age 20 in a car accident and I know firsthand the ache of losing a child. However I also know hate and anger just stir up more hate and anger. Let’s love like Jesus does and hopefully make this world of ours a little sweeter. Blessings to you and your precious family!